Procedure: Combine sugar, vinegar, water and cinnamon sticks; add cloves and allspice that are tied in a clean, thin, white cloth. Bring mixture to a boil and simmer, covered, about 30 minutes. Wash and peel peaches; the stems may be left on if desired. If peaches are large, halve or quarter. To prevent peeled peaches from darkening during preparation, immediately after peeling, put them into a cold solution containing ½ teaspoon ascorbic acid per 2 quarts water. Drain peaches just before using. 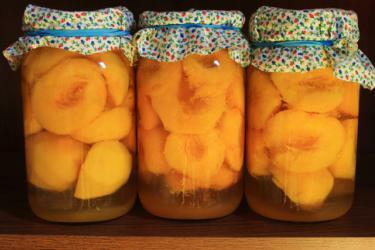 Add drained peaches to the hot syrup, bring to a boil, lower heat and continue simmering for another 20 to 25 minutes. Pack hot peaches into hot pint jars; add one 2-inch piece cinnamon stick per jar. Cover peaches with boiling syrup, leaving ½-inch headspace and making sure peaches are covered by the syrup. Remove air bubbles and adjust headspace if needed. Wipe rims of jars with a dampened clean paper towel; adjust two-piece metal canning lids. Process in a Boiling Water Canner.